Flintoff's famous commiseration for Lee occurred moments after England wrapped up a famous two-run victory at Edgbaston during the 2005 Ashes series. 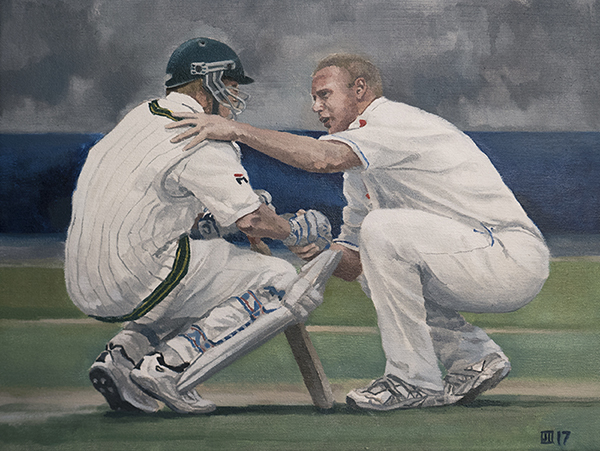 The Test had already provided the most dramatic ending to a match that I've ever seen during the greatest series the game's most enduring rivalry has produced, when Flintoff and Lee were captured in this iconic image which seemed to sum up the very essence of sportsmanship and the spirit of cricket. It is all the more poignant because of the unrelenting human drama of the three and a bit previous days, a plot packed full of twists and turns, spectacular action, suspense, contemplation and psychological intrigue.